Clear skies. Low 52F. Winds NNW at 5 to 10 mph..
Columbia Police released photos of persons of interest in the shooting of three men early March 18 in Five Points. Anyone with information is asked to call (888) 274-6372. COLUMBIA — Three men were shot early Sunday in Columbia's Five Points district hours after thousands of revelers celebrated St. Patrick's Day. The shooting was the second one involving multiple victims in a Columbia entertainment hub in the past six months. Nine people were wounded after a shootout outside the Empire Supper Club in the Vista community as the bar closed after on an early Sunday morning in September. 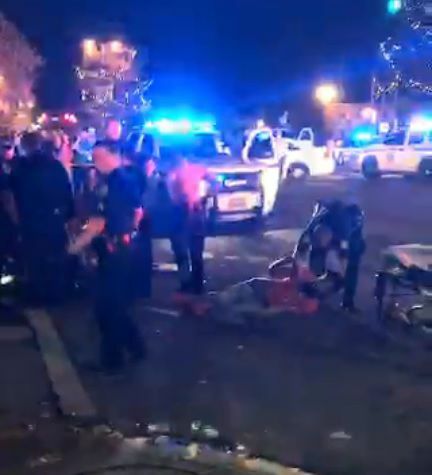 The victims in the latest incident, all from outside Columbia, remain in hospitals after being shot just before the 2 a.m. bar closing time in one of the entertainment area's busiest intersections, Columbia Police Chief Skip Holbrook said. Two of the victims remained critical condition Monday, while a third was released from the hospital. Two men were arguing before the shooter fired multiple times into a large crowd, police said. None of the victims took part in the fight. Police arrested a Columbia-area man in the shooting later Sunday. Five Points is a shopping and dining district most hours, except for late night when the area near the University of South Carolina campus becomes the main entertainment destination for students. While neighbors complain about boozing and fights typical of a college hangout, occasional brutal violence has broken out in Five Points at night, including beatings and shootings. On Sunday morning, a video posted on Twitter showed two shooting victims lying in the intersection of Harden and Greene streets while being attended by police officers and paramedics. People in the crowd shouted at first responders ("Get that man up!") and tried to comfort victims ("I'm here, bro. You good."). A woman could be heard crying while wailing, "Why?" A third wounded man was found at the intersection of Greene and Pavillion streets, a block away from the other victims. The identities for two shooting victims Sunday were not released, but police said they were a 22-year-old stationed at Shaw Air Force Base in Sumter and a 20-year-old from Winnsboro. Howard Boone Jr., a 23-year-old from Raleigh, N.C., majoring in criminal justice at St. Augustine University, was critically wounded, the North Carolina college said in a statement. Boone was visiting friends in Columbia and "was an innocent victim," the school said of the Army Reserve Officer Training Corps member. Columbia Police said Sunday evening that they charged Arthur Jones Jr., 22, of Hopkins with three counts of attempted murder and possession of a weapon during a violent crime. He was sent to the Alvin S. Glenn Detention Center. He received a $3 million bond on Monday, according to multiple media reports. Jones and other three men turned themselves into Columbia Police after the department released photos of them taken from surveillance cameras after the shooting. The three other men were not involved in the shooting and were not charged, police said. The popular bar district was busier than usual because the popular St. Pat's in Five Points festival had ended a few hours earlier. But the night was relatively calm, Holbrook said, with only one arrest for a fight about an hour before the shooting. Even the Five Points St. Pat's event, where streets are closed to accommodate more than 40,000 partygoers who crowd band stages and flock to a fleet of beer and food trucks, did not create much trouble. Police made five arrests during Columbia's largest annual festival, the chief said. But Sunday's shooting was the third major incident near the busy Harden and Greene street intersection in less than five years. Last year, a white bar owner was charged with putting a chokehold on a black patron. The bar closed after the assault allegation. Sunday's shooting took place across the street from where a USC freshman was shot and paralyzed by a stray bullet in October 2013. That led police to crack down on gang activity in bars around the area. Five Points has struggled to balance its image. Merchants often offer reminders that the village neighborhood, as they call it, is a safe place that should not be defined by a few outbreaks of late-night violence. They point to crime in other popular Columbia night spots, including the Vista. No one died in the Vista shootout in September, but a fan from Kentucky in town for a football game was critically wounded after being struck in the face. One victim was paralyzed while another suffered brain damage, according to The State paper in Columbia. At least five arrests have been made in connection with the shootings.